Integrally colored concrete—where the color is uniform throughout—can be used in flatwork, vertical and tilt-up projects. Say hello to integrally colored concrete. If you have good knowledge and technique working with non-colored concrete, you should be looking for opportunities to sell integrally colored concrete projects, because you already have the necessary skills. Often selling a colored concrete job is as simple as letting the client know it’s available. Concrete, the traditionally utilitarian product we all grew up with, is a nice design medium. For many people, it just doesn’t enter their minds. Nick Paris, vice president of marketing at Davis Colors, observes that though residential driveways and commercial building entrances comprise the majority of colored concrete sales, there are a variety of other opportunities. Patios, swimming pools, basement floors, walkways, garden walls and flowerbed edging are just a few ideas. Integrally colored concrete—where the color is uniform throughout—can be used in flatwork, vertical and tilt-up projects. Other concrete-related industries are also producing integrally colored pavers, masonry blocks and stucco. Integrally colored concrete is another design option like other concrete coloring techniques, such as stains and paints. 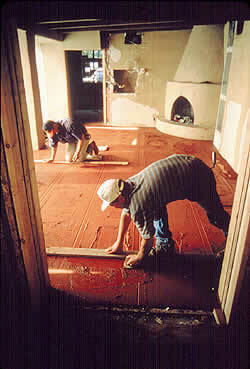 Iron oxide, the same compound found in rust, is the most commonly used pigment to color concrete. It occurs in four colors: black, red, brown and yellow. Various blends of these four pigment colors result in an array of other colors. Cobalt and chromium oxide provide blue and green pigments. The cost of green and blue pigments is typically very expensive, however, reports Steve Maycock, vice president and national sales manager of QC Construction Products. To obtain a truer color, white cement is required, which boosts the cost even more. When coloring concrete you can use either natural or synthetic pigments. Synthetic pigments are chemically the same as natural pigments, but there are other differences. Natural pigments tend to be less expensive, but their range of colors is limited and they don’t have the tinting strength of synthetics. Natural pigments tend to produce warmer colors, which seem closer to the colors you see in nature. Synthetic pigments are more vibrant and you have more color options, but the colors may appear cooler. Which you use may depend on what color you need. For example, natural reds have a warmer, brown undertone, but if you want a real bright, brick red you might choose a synthetic pigment to achieve that color. When you’re selecting a color, “Color charts can only serve as a guideline. Color samples are a more accurate representation of how the color will look in the concrete,” says Bob Harris, director of product training at L.M. Scofield. “Whenever possible, do a mock-up—especially if color is critical. Test panels, made by using the exact pigment, cement, sand, aggregate and water, will show you the color of the final product. Mark Bridges, vice president of sales at New Riverside Ochre Company Inc., says “Years ago the complaint was that you got what you dug up [with natural pigments], so every lot and producer’s colors were different.” But he reports the standards adopted by natural pigment producers are the same as those used by the synthetic producers. The color of the cement used in the concrete can alter the color. Lighter colored cement allows you to achieve a brighter, truer color, especially when light and pastel colors are desired. “Gray cements will allow you to get good colors, too, but you might need to use more pigment. If you want a dark colored concrete, a dark gray cement might help you,” Hoffman says. When you’re coloring concrete, you’re coloring the cement, not the sand and not the aggregate. Since the cement encapsulates the sand and aggregate, unless you have an exposed finish, the color of the sand and aggregate used doesn’t affect the color of the concrete very much, but they can add some subtle tones. To maintain consistency of several batches of the same color, it is important the ready-mix supplier use the same ingredients in all the batches. The same cement, sand, aggregate and filler—all from the same source. The water-to-cement ratio is also extremely important, especially if several batches of the same color of integrally colored concrete are being mixed. Different amounts of water will change the color intensity. The best rule of thumb is to use the lowest water-to-cement ratio that is workable. A 3-inch to 4-inch slump is recommended, says Hoffman. One ingredient you should never use with integrally colored concrete is calcium chloride. Because it hydrates cement at different rates in different parts of the pour, it will cause discoloration and blotching. Improvements in the way pigments are handled and added to the mix make them easier to use than ever before. Dry and liquid pigments, some blended with set controlling and water reducing admixtures, are available. Some pigments come in special bags, which disintegrate during the mixing process. No matter which product is used, start with a clean mixer drum before batching and make sure you get good color dispersion as you combine ingredients in your mix. More pigment is needed if stronger colors are desired, but color addition should not exceed 10 percent of the cement content. Subgrade preparation is also important, says Steve Johnson, director of ready mix marketing and technical services at Solomon Colors. “You want a well-drained sub-base, especially in areas with a lot of clay that don’t drain well because water can migrate up and cause excessive bleed water.” Bleed water can fade the color in integrally colored concrete. Pay attention to the weather, temperature and other job site conditions, Johnson advises, especially if you have several pours. Each pour should be made under as close to the same conditions as possible to ensure consistency in color. Once the color is altered, it’s permanent. Virtually every problem with integrally colored concrete—water entrapment, trowel burning, mottling, and other things—would also occur in non-colored concrete installed in the same manner, observes Maycock, but “as soon as you add color, people’s expectations are greater. The bar is raised and everyone wants perfection.” Doing the job right the first time is even more critical if you consider that integrally colored concrete is difficult to repair and match at a later date. Adding color increases the price over non-colored concrete, but it is less expensive when factoring in labor costs over other coloring methods. And “integral color is considered a natural product,” says Maycock. “It’s natural characteristics and inconsistencies are its beauty.” That may be another reason it is being used more and more. Integrally colored concrete allows structures and hardscapes in the landscaping to blend with the environment. Hoover observes, as you travel around the country, you see different colors used. “The colors used in Virginia can be completely different than what’s used in other parts of the country. Slate colors are used more in areas where natural slate is common. Designers are looking at the natural environment and selecting coloring agents that match or compliment the natural environment and existing structures.” In the southwest, you’ll tend to see colors that match adobe; in New York, brownstone. It is important to know that most manufacturers offer custom color design services. The colors selected may also be based on climate. Darker colored concrete will absorb more solar radiation, something that might be advantageous in northern climates. In the south, lighter colors can be used as solar reflectors to keep heat from building up. The most common advice from all the experts is to develop a good relationship with your ready-mix provider or distributor and the NRMCA. From designing new color mixes to ensuring the product delivered to your job site is consistent from batch to batch, your distributor and ready-mix provider can be your best friend. For additional information and resources concerning application techniques and specifications please reference these professional trade organizations. NRMCA - National Ready Mix Contractors Assoc. PCA - Portland Cement Association. ASCC/ DCC - American Society of Concrete Contractors/Decorative Concrete Council. With integrally colored concrete, color problems are frequently the result of poor ﬁnishing techniques. Tips for finishing integrally colored concrete.